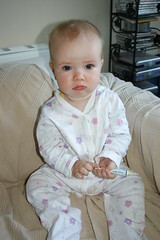 I'm sick - or so mummy and daddy tell me - I've never been sick before. First I had a cold and then my breathing got bad and the doctor tells me I have a chest infection. On Tuesday and Wednesday I couldn't even be bothered crawling or eating but yesterday I crawled and smiled a bit so I think everyone is less worried now.